Did everyone catch last week’s premiere of CNN’s fantastic series – The Sixties? What fun! Last week focused on the iconic shows and personalities dominating the Television Era in The Sixties. As someone who began her young adult years during the 1960s, these precious televised memories came flooding back. For an hour, I felt like a teen again, so thank you CNN for this! My only complaint – it was only an hour. CNN easily could have filled two hours with this documentary but time and money were probably a detriment to expanding the show to 120 minutes. This week, The Sixties becomes somewhat more somber, as the documentary will focus on the signature political events associated with this decade. Most notably political personalities such as President John F. Kennedy, President Richard Nixon, Martin Luther King and so many more will be highlighted. Did you watch last week’s show? Which events are you looking forward to digesting on this week’s episode? 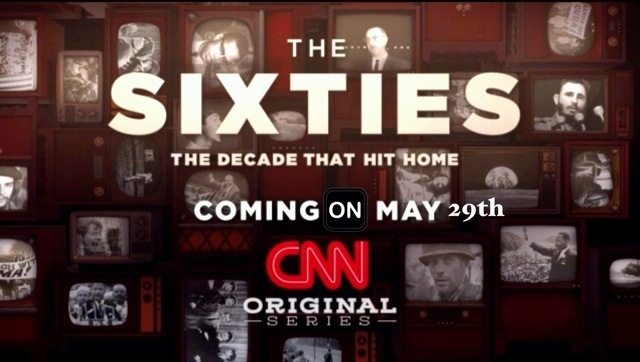 The Sixties airs on Thursday, June 5th at 9:00 PM on CNN. Comments are now open for Sixties business. I saw part of last week’s show. Maybe it is presented elsewhere? Tonight’s show focused a lot on President Kennedy. They presented what seemed as weaknesses of President Kennedy, but I (as a young teen) didn’t see him that way at all. I was idealistic. The series is good; the commercials are maddening!